Towards the end of 2014 I received an email from the Postgraduate & Research Students’ Association at the Australian National University (PARSA ANU). It stated that they were moving to a new office space and that they therefore needed a new design for for the meeting room. One of their team had spotted my artwork, and wondered if they could commission my Eurocentric world-map as a potential image for the glass partitions of the room. As they are based in Australia, I wondered if they might not prefer to use Antipocentric instead. As soon as they’d seen this version, Antipocentric it was! They specifically liked the fact that “the image embodies global connections, is fresh, creative and interesting“. 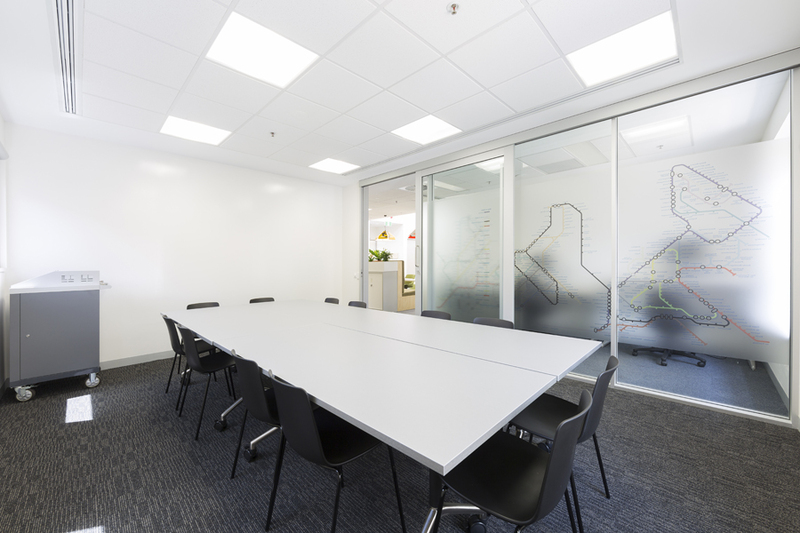 They were also pleased that “it also works well for a meeting room as it reminds users of the planning aspect of tasks“. 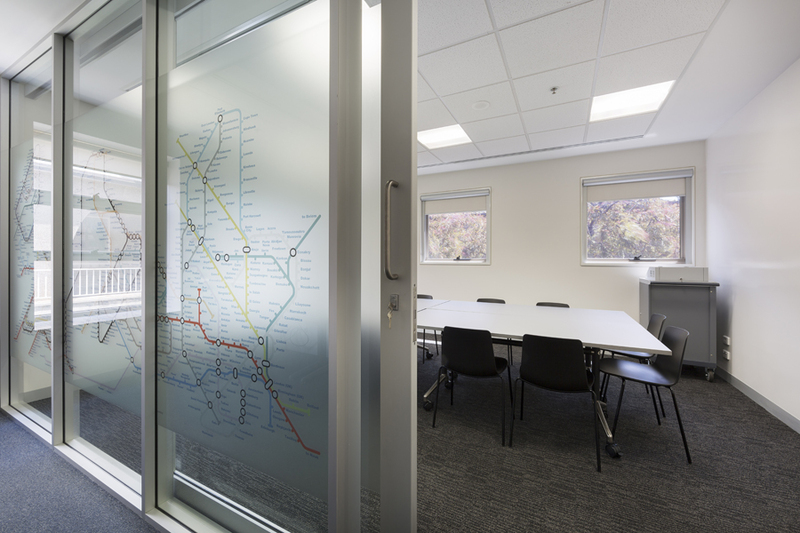 The image was sent across to the printers, Screenmakers of Canberra, where it was converted to translucent film and thereafter applied to the glass. Student Assistance Officer, Wayne Joseph told me that “everyone loves it! Quite literally…general visitors and guests at our grand opening all took time to contemplate it“. He went on to mention that many remarked that “it’s such a cool concept, and others were especially pleased that it’s Antipocentric. It plays well into an emerging transportation theme because of the street-sign light fixtures, and also matches a piece of artwork that we acquired. Moreover, it reflects the transient and global nature of ANU postgraduate students“. The room space looks fantastic; I wish I had a studio as spacious and light as that. Perhaps I should move to Australia, although I’d most likely need to drug my wife in order to do so! The only issue I can see with this piece of work on full display in a meeting room might be that it is bound to take the attention away from the business at hand, as people tend to spend quite a lot of time simply plotting the points on the lines. Wayne got around this when he told me “as for being positioned in a meeting room, well, at least our representatives will be guided in their daydreaming during meetings & will hopefully find their way back to the tasks at hand“. I’m really pleased with the commission; it’s a great display space in an incredibly reputable establishment, which will be well used by people who will hopefully appreciate the piece. So am I allowed to blow my own trumpet?